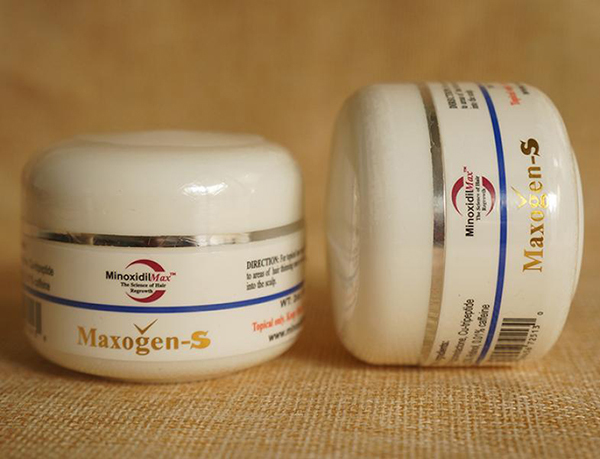 Maxogen-S topical spironolactone has the main effective ingredient spironolactone at 5%, a safe antiandrogen that can be used for both men and women. Maxogen-S is absorbed and metabolized rapidly. It only has local effect without any systemic effect. It can be used by both men and women. Maxogen-S has additional ingredients Retinol, Caffeine, and Copper tripeptide to enhance its effectiveness. B. How to use topical spironolactone Maxogen-S? Maxogen-S is very simple to apply. Dab some on your fingertip and work it in around the base of the hairs (try not to get it on your hair). You just need a thin film covering your hair loss area. The lotion is absorbed by your scalp very quickly. You can use Maxogen-S on its own, twice daily. You can also use it with a minoxidil product like minoxidil 15%, in which case it is recommended to use the minoxidil alone in the morning and use both Maxogen-S and the minoxidil product in the evening. In the evening, you can apply maxogen-S first and wait for half an hour before you apply the minoxidil product. Try not to use too much Maxogen-S. See the picture below for how much Maxogen-S you should use. How Does Topical Spironolactone Work? Oral spironolactone has been used as a potassium-sparing diuretic since 1960s, marketed under a variety of brand names, including Aldactone, Novo-Spiroton, Aldactazide, Spiractin, Spirotone, Verospiron and Berlactone. It is often shortened as spiro. It was serendipitously discovered to reduce hair in female who had too much hair (hirsutism) in 1990s. Soon it was used off-label to treat female pattern hair loss by experts in hair loss field. It appears to be counter-intuitive that a substance can be used to treat both excessive hair and hair loss at the same time. In fact, oral spironolactone works for hirsutism treatment by reducing the testosterone level (female with hirsutism have high male hormone testosterone); while it works as an effective hair loss treatment due to the same reason-- reducing testosterone level. As we know, female and male pattern hair loss is caused by excessive dihydrotestrone (DHT). Testosterone is a precursor for DHT. By reducing testosterone level, it lowers DHT level. In addition, spironolactone binds to DHT receptor of the hair follicles so DHT cannot bind to it and do any damage to the hair. Sinclair et al performed a clinical study with 40 female taking oral spironolactone (200mg daily). It showed 88% of women receiving oral spironolactone either stopped the progression of their hair loss or saw improvement [Reference 1]. Carolyn et al did a retrospective study and found that 73% of the subjects (29 out of 39) with female pattern hair loss who received oral treatment (~110mg daily) reported stabilization or improvement of their hair loss [Reference 2]. Adamopoulos et al studied the effect of oral spironolactone in 4 young people (age from 19-23 year old) . The four people (two female and two male) took 100 mg spironolactone twice daily for 6 months. Results showed hair loss was reduced significantly and more hairs are in growing phase (anagen phase) in all 4 people. The study also showed a considerable degree of relapse post the treatment, which indicates the continuous use of spironolactone is necessary to keep the result [Reference 3]. Although there is no official study reported in peer review articles to demonstrate how well topical spironolactone works, there is little doubt it works just as efficient as oral spironolactone. Hair loss experts have used topical spironolactone for hair loss treatment in women and men for long time. Dr. Richard Lee, a Los Angles based dermatologist, was probably the most famous one. He used it to treat his male and female customers for more than 10 years until his retirement. Spironolactone is a weaker DHT blocker compared to finasteride. Spironolactone can be used by both men and women, while finasteride is for men use only. 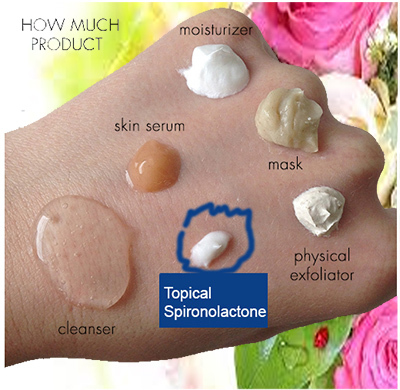 Spironolactone is rapidly and completely metabolized in the skin and does not affect any other organ system. In about 1% of patients, a rash can develop. If this happens, the patient should discontinue use of topical spironolactone. .
What is the drawbacks to the use of topical spironolactone? Although topical spironolactone is pharmacologically one of the very effective topical treatments for male and female pattern baldness, there are inherent drawbacks, e.g. spironolactone has a disagreeable odor if it is not formulated right. We spent years of research and development to minimize the unpleasant odor. What would recommend to use with this product? If you want to use minoxidil with this product, you can use any minoxidil product we offer. 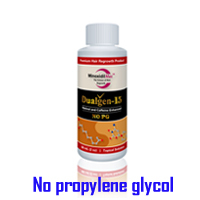 If you tolerate minoxidil very well, you can use this product along with our Dualgen-15 NO PG. For me, this product immediately stopped the itch. It is complimentary to other products and can easily be added to your existing regimen. Definitely helps with shedding.